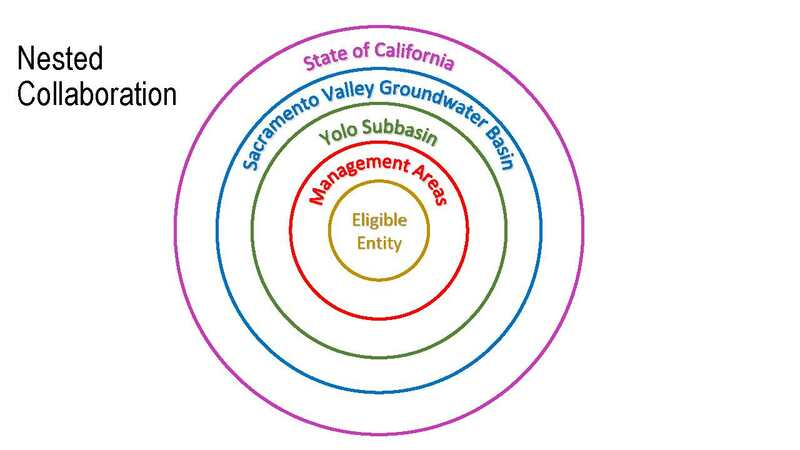 The Sustainable Groundwater Management Act (SGMA), passed in the fall of 2014, established a new structure for managing California’s groundwater resources at a local level. The legislation requires that by June 30, 2017, locally-controlled groundwater sustainability agencies (GSAs) must be established in all groundwater basins that are designated high or medium priority. At the California Irrigation Institute’s 2017 conference, held at the end of January, irrigation district representatives discussed how their regions were working towards forming Groundwater Sustainability Agencies in their regions. The Sacramento Valley groundwater basin stretches from Red Bluff at the northern extent down to Rio Vista at the southern extent. It is divided into 18 sub-basins. Ms. Sicke’s presentation focused on six: the Colusa, Solano, Yolo, Sutter, and North and South American sub-basins. 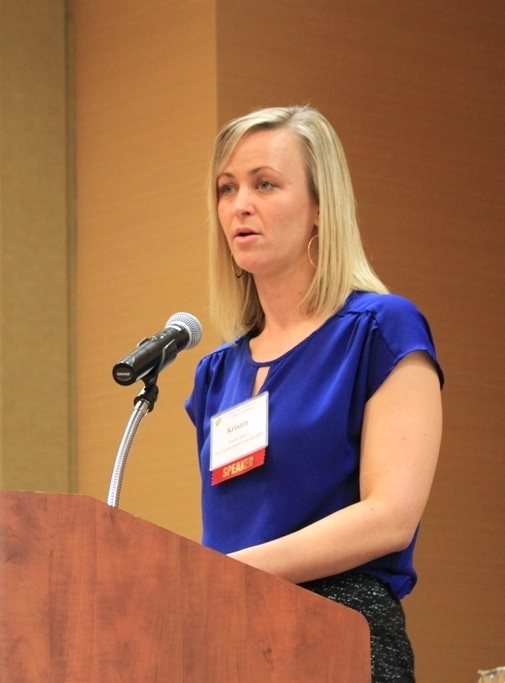 Ms. Sicke said there are two approaches to governance: forming your own groundwater sustainability agency and then working with other groundwater sustainability agencies within your sub-basin which would be considered a coordinated government approach; or to get all the agencies together within a sub-basin and to consolidate and form one groundwater sustainable agency or GSA, which would be considered a consolidated approach. She then discussed each approach for the sub-basins, the stakeholders who are primarily involved, and their role. She noted that the primary concerns seem to be pretty similar across all these sub-basins. 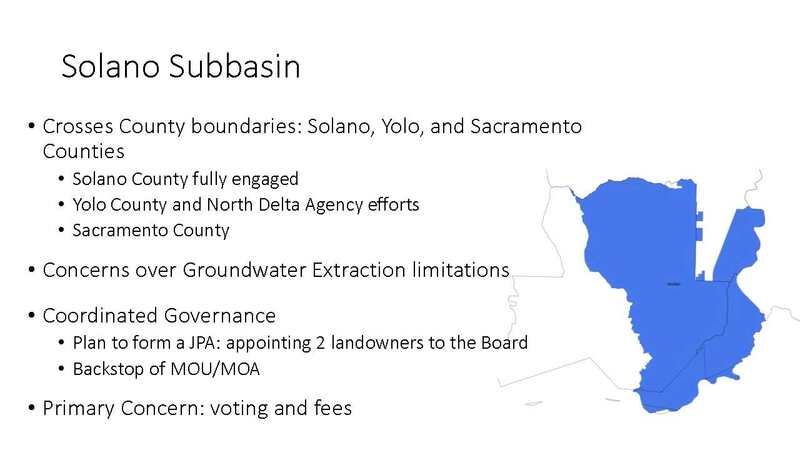 The Yolo sub-basin had three groundwater basins that have been consolidated down to one. 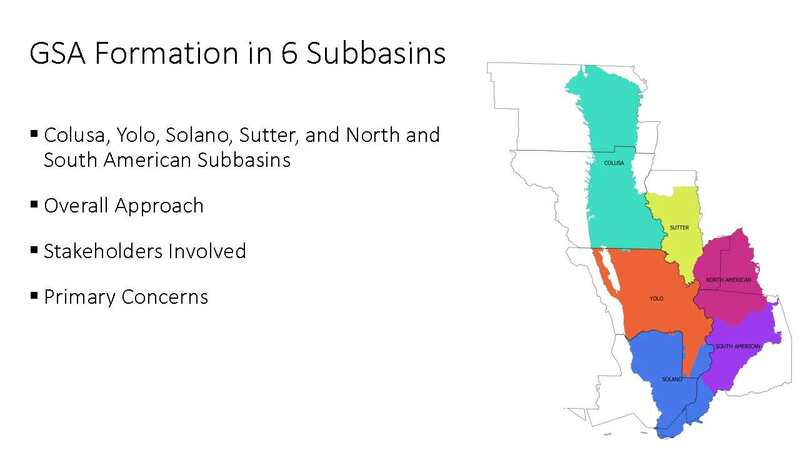 Three reclamation districts had actually opted out of our consolidation process to go with the Solano sub-basin in the Northern Delta. 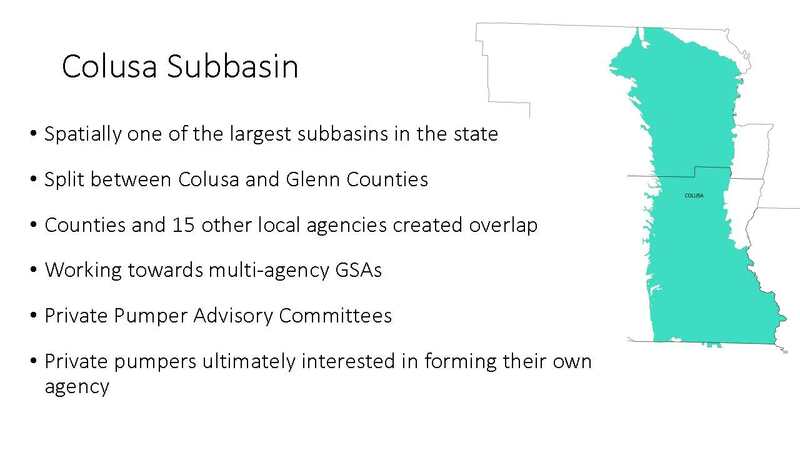 A basin boundary modification was approved and so they have been working on a consolidated approach of having one groundwater sustainability agency to submit one plan for the whole sub-basin. 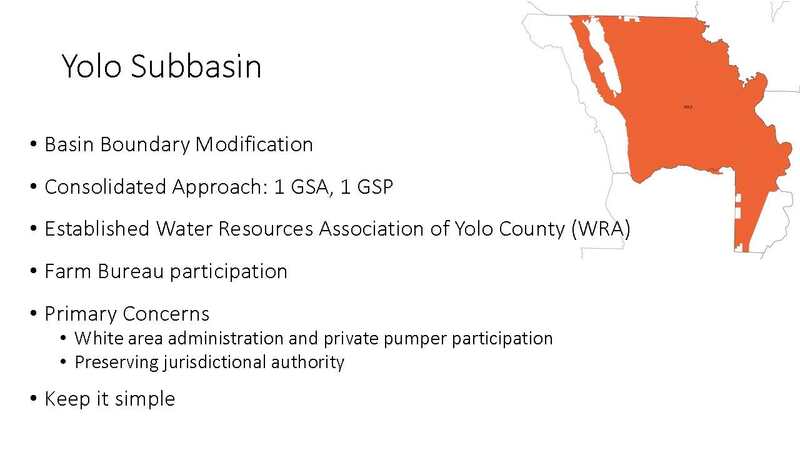 The Water Resources Association of Yolo County has been established for more than 23 years, and has a history of groundwater management and monitoring information. It will be primarily the same group of the WRA that will be moving to the consolidated GSA, plus some new members. The last two sub-basins are the North American and South American sub-basins. 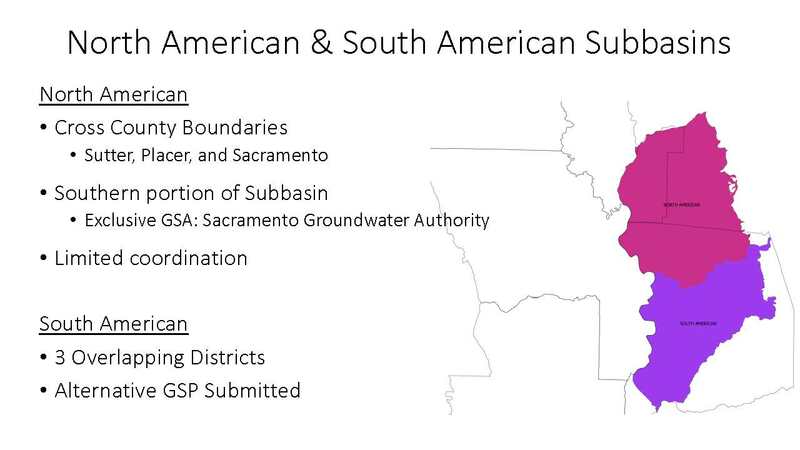 The North American sub-basin is shown in pink on the slide; it crosses Sutter, Placer, and Sacramento Counties. Ms. Sicke said that in talking with Sutter County, they are going to be responsible for that portion of the sub-basin, and Placer County has kind of gone their own way too and they haven’t coordinated much to date. Chris White is general manager and the district engineer of Central California Irrigation District, one of the largest irrigation districts in the Central Valley, serving over 1,600 farms across more than 143,000 acres of prime farmland in Stanislaus, Madera, and Merced counties. 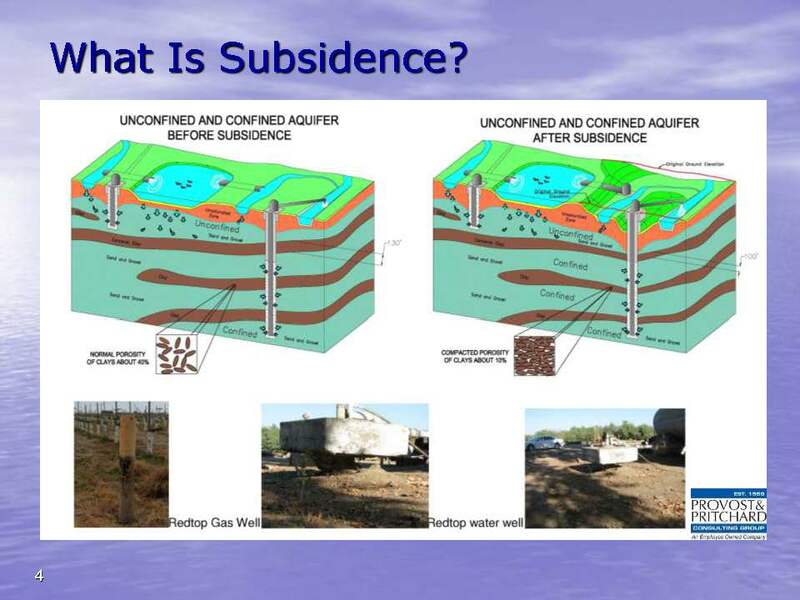 His presentation discussed subsidence in the district’s service area and how they see it tying into compliance with the Sustainable Groundwater Management Act. He began by presenting a map of subsidence in their service area that occurred between 2012 and 2016. New subsidence has been discovered in the area just to the east of their boundaries. The areas in red have subsided 3 to 3 ½ feet. There are also flood control channels running through the area; the Chowchilla Bypass and the East Side Bypass run right through the middle of the subsidence area. They met with landowners, and as a result, they decided to do a study to determine a project that would make the the area sustainable. New agriculture established since 2008 was thought to be the cause of the subsidence. 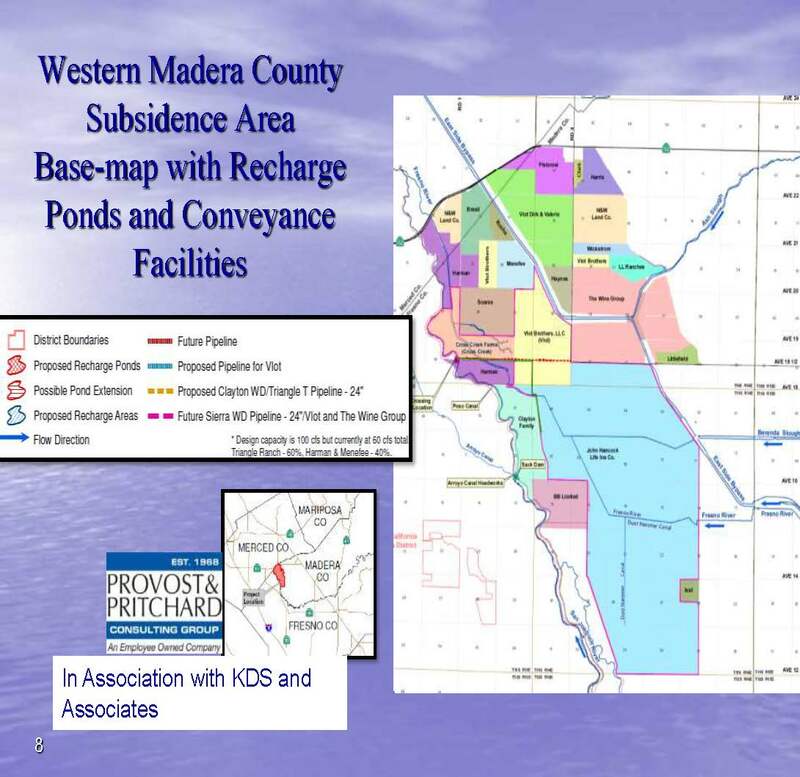 Both Madera and Merced County contributed to the study, along with local landowners and even the Central California Irrigation District contributed funding for the study, even though it was not in their service area, but to the east of the area where it was occurring. Mr. White said the study proved out a hypothesis that it is indeed possible to convert this area from a deep aquifer pumping system primarily to a shallow groundwater bank for use on the overlying land. 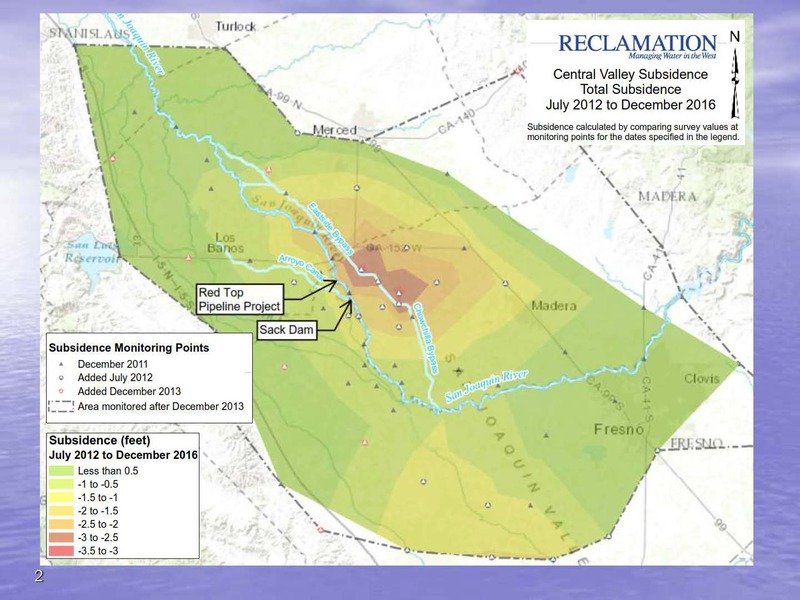 Stopping the subsidence is important because if it’s not stopped, there will be flooding impacts in western Merced and Madera Counties, including Highway 152, an elementary school, and the City of Dos Palos, as well as valuable farmland and dairies in the area. It also jeopardizes the water supply for San Luis Canal Company and for the Central California Irrigation District – they could lose up to 20% of their ability to take water off of the river. It also jeopardizes the San Joaquin River Restoration Program, as there are several projects in that section of the river. The picture on the left bottom is showing a gas well sticking out above the ground; he noted the landowners painted it orange at the ground surface, and it’s now sticking up out of the ground eighteen inches. The pictures in the middle and the right are where they poured a concrete slab at the surface of ground, and as the ground subsided, the well is now protruding out of the ground. The Chowchilla and the East Side Bypass are flood bypasses that are going to need remediation eventually as they’ve lost capacity. There are two areas that are going to need some work and some remediation eventually where we’ve lost capacity. It is affecting 8 miles in Madera County and 6 miiles in Merced County. The capacity of the bypass is 16,500 cfs design capacity. The county is in the process of forming a GSA to cover the areas between the exchange contractor’s districts and the other districts. 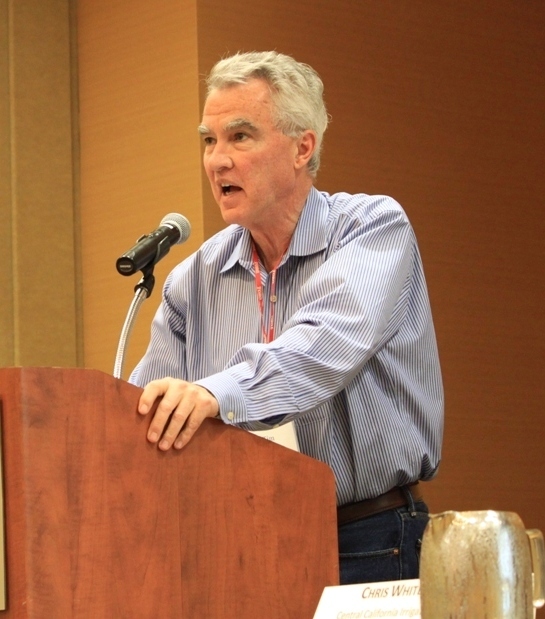 They have been working with landowners in the area and their vision is to form their own water district to manage the water supplies they need to manage as part of this program, and to have their own GSA coverage, he said. In the middle, there’s the proposed Triangle T water district, which was just approved through LAFCO. Mr. White next presented a map showing the landowners, the Triangle Ranch and the block Ranch. The flood control channels are highlighted on the map, so they can pull flood waters off when available and use them for recharge; there’s also a sinking pond to get water into the ground. “Our studies show that over the long term with the frequency of flood that we see either coming down the San Joaquin or the Kings River, there’s enough flood water here to tank that shallow groundwater up,” he said. Robert Johnson is Deputy General Manager of the Monterey County Water Resources Agency in charge of water resource planning and management division. 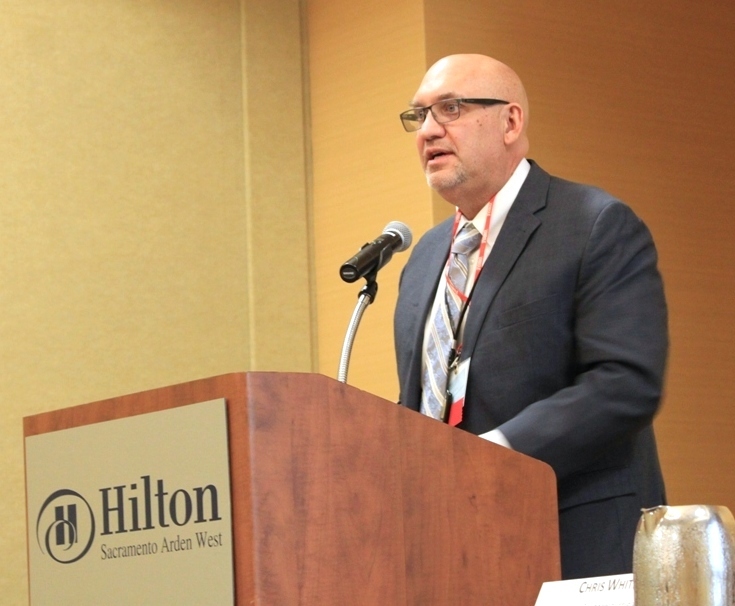 His focus lately has been the recently passed Sustainability Groundwater Management Act implementation for Monterey County and the Salinas Valley. Monterey County is home to an $8 billion dollar ag industry with about 300,000 acres of irrigated land; the next biggest economic driver is tourism at about $2 billion. The Salinas Valley is dubbed ‘the salad bowl of the world.’ However, there is sea water intrusion and nitrate issues. The average groundwater use is about 550,000 acre feet a year, with a 90/10 split between agriculture and urban. Groundwater is the primary source of supply and storage. The groundwater basins are the Pajaro Basin, the Salinas Valley Basin, the Carmel Basin, and the Seaside Basin. The average outflow from the Pajaro River is over 100,000 acre feet; on the Salinas River, over 300,000 acre feet; and on the Carmel river, over 70,000 acre feet. “These are the resources that are really going to have to be leveraged to bring sustainability about,” he said. The collaborative workgroup has representatives from all different interests: the agencies, the county, cities, special districts, PUC regulated water companies, environmental groups, multiple agricultural representatives, disadvantaged communities, and small rural well owners. “Really diverse interests make for interesting meetings, especially after hours,” said Mr. Johnson. After months of deliberation, the collaborative work group decided to move forward with a groundwater sustainability agency that is a joint powers authority. In October, they reached consensus on what the potential agreement would look like, and then the Marina Coast Water District, a small water district near the coast, filed a notice of intent to manage their portion of the basin. There was a basin boundary adjustment that helped that go along. 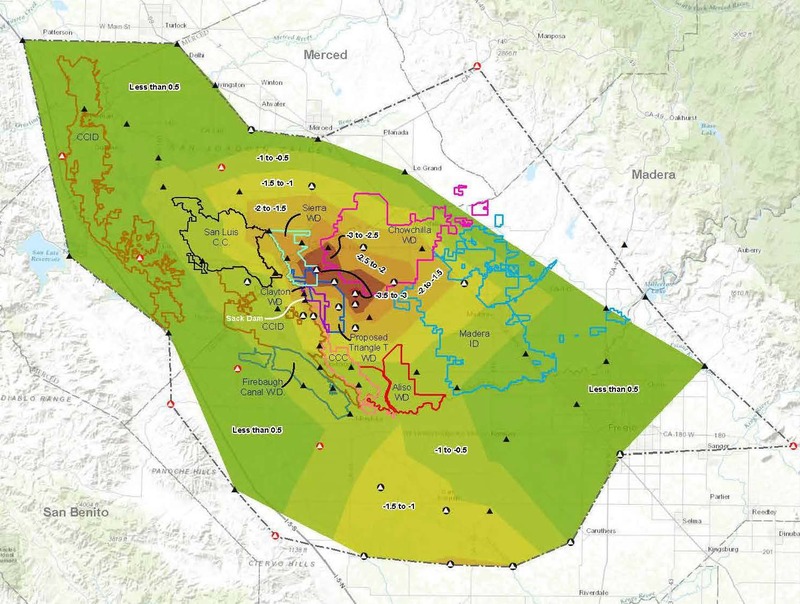 The proposed GSA/JPA would be over the entire Salinas Groundwater Basin, which includes part of the Paso Robles Basin, another basin with challenges. “We’re looking at establishing the area we’re going to manage and then establishing cooperative agreements with the other entities that would be touching those areas,” he said. Because of the issue with the board of directors, they have seated an interim board that will be in place until September 30, while they work through seating a permanent board. Mr. Johnson presented a configuration of the board and noted that the city of Salinas has a seat, a south county city has another seat, and all the other GSA eligible agencies have one seat, a rotating seat. Disadvantaged communities and small public water systems and CPUC-regulated entities each have a seat; agriculture has four seats, environment gets a seat and public member gets a seat. The interim board will sit until September 30; they will hire the executive director and a consultant for the plan itself. The members of the collaborative working group will have the opportunity to be an advisory committee for the full board. “After spending 18 months and 16 meetings so far, they’ve gained a lot of knowledge, which I think is very important,” he said. “To really wrap this up, through this process, we have really seen that if we do want to complete this on time and get buy in from everybody, that completion does really require commitment,” concluded Mr. Johnson. The Calleguas Municipal Water District is a State Water Project contractor; they are pretty much the sole source of water for the town of Simi Valley and Thousand Oaks and almost 100% dependent on northern California water. “We come almost to the Ventura/LA county line and all the way to the coast and then all of the plain basically is our territory,” he said. In terms of sustainability agencies, Santa Paula and the Ojai basin are adjudicated. The Fox Canyon Groundwater Management Agency was declared in the legislation as the named entity for its area, and a cooperative of three different entities, Camerosa, Fox Canyon Groundwater Management Agency and city of Camarillo are dealing with Santa Rosa Basin. The Upper Ventura River formed an agency recently and just had their first meeting. They are working to create a joint power authority. At the stakeholder meeting, they had a group of agricultural pumpers who wanted a role, so they adjusted the JPA document to make it more inclusive of the new group. Ultimately, that JPA will become a GSA. The Fox Canyon Groundwater Management Agency is a large part in the middle part of the county. They were listed in the legislation. The Oxnard Plain, Pleasant Valley, and Los Posas basins are managed by Fox Canyon. They also have a basin boundary issue to deal with. Neither the Mound basin or the Piru/Fillmore basin group were ready during the first basin boundary adjustment window; it just wasn’t physically possible to get it done. They are now in a situation where the June 30 deadline is looming and the next basin boundary adjustment window is in 2018. There are separate stakeholder groups, one M&I and one ag that are deciding what to do with that yield. The pumpers on the Oxnard Plain and Pleasant Valley Basin are looking at some significant cuts. They are trying to figure out how they will allocate those cuts; there’s a water market group looking at that as a possible tool to minimize the impacts. More from the California Irrigation Institute Conference: Growers give their perspectives on SGMA Implementation.